Okamoto Sandusky Manufacturing is a manufacturing company devoted to developing and processing synthetic leather materials for the transportation industry. We have a wide range of technical skills both overseas and in North America. We have made it our business to process, produce and provide high quality synthetic leather that satisfy our consumers’ requirements. You can count on Okamoto products. Okamoto Industries, Inc. is a manufacturing company devoted to developing and processing rubber and plastic materials for consumer products. We have implemented a wide range of technical skills overseas and have made it our motto to process, produce and provide high quality goods that satisfy our consumers. Since Okamoto Industries, Inc. was established in 1934, we have constantly developed innovative technical skills to provide merchandise that will facilitate the lives of our customers. We, Okamoto Industries, Inc., have held our own in the competition with other manufacturing companies. The competition in the market still continues, within Japan as well as overseas. Wherever it may be, we will use our best efforts to achieve customer satisfaction and support for all “Okamoto” products. The only merchandise that is accepted with pleasure among people in the world is what is provided to meet the users needs. That is to say, we at Okamoto Industries, Inc. have an enourmous duty to fully satisfy our users, sellers, vendors, stockholders, financial agents, employees, our associated companies and their families through our business. We absolutely promise them progress as a company in order to guarantee their satisfaction. 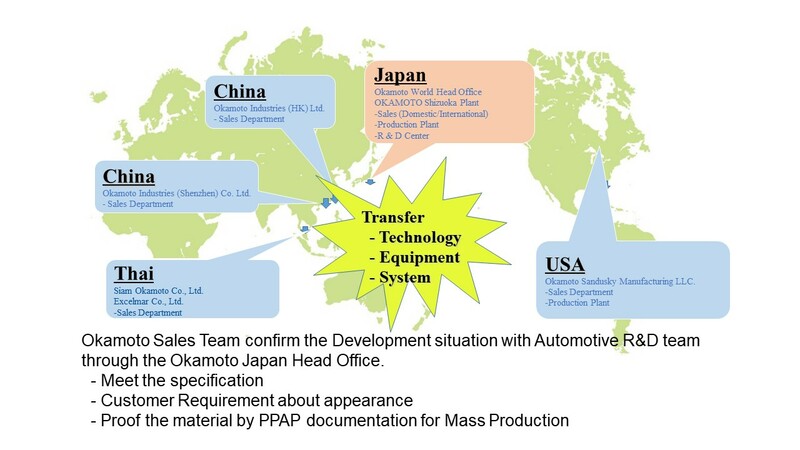 Since 1950, Okamoto has been the leading manufacturer of automotive interior materials in Japan. Okamoto’s products are both Thermo Formable materials and wrappable cut and sew materials made of blended PVC/foam, TPO/foam, PVC/Urethane foam, PVC coated fabric, etc. 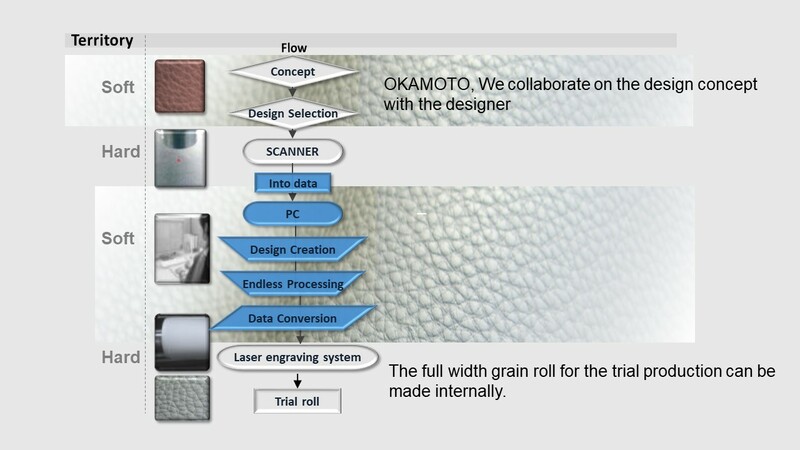 Currently, Okamoto supplies various synthetic leather interior materials to the North American and Asian Automotive OEM Manufacturers such as Honda, Toyota, Nissan, and Subaru. Okamoto also manufactures vacuum formable seating materials for motorcycle and power sports manufacturers in Japan and North America including Harley Davidson, Honda, Yamaha, Suzuki and Kawasaki. 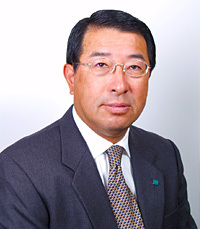 Okamoto has a majority market share in this field. 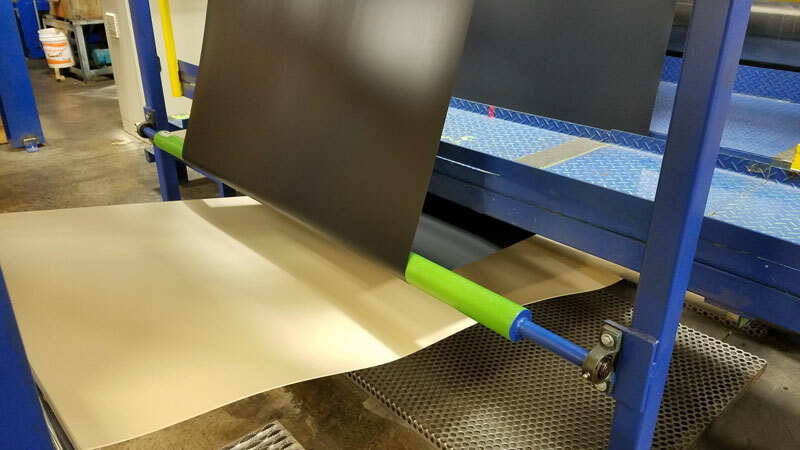 OKAMOTO Sandusky Manufacturing has many process capabilities such as Calendering, Coating, PCA Application and Sheeting. Whatever best meets our customers requirements, at an economical cost will be approved by our customers. We are in a superior position to serve the automotive industry worldwide. OKAMOTO currently supplies various interior materials to the North American and Japanese Automotive Industry including Honda, Toyota, Nissan, and Subaru. OKAMOTO’s synthetic leather materials are made of blended PVC/Foam, TPO/Foam, PVC/Urethane Foam, PVC coated fabric, etc…..
OKAMOTO is supplying seating materials for motorcycle manufacturers in Japan and North America including Harley Davidson, Honda, Yamaha, Suzuki, and Kawasaki. OKAMOTO is the pioneer vacuum formable seating material for motorcycles in Japan where we hold a majority of the market share in this field. Our Shizuoka, Japan Plant has a variety of machines including calenders and extruders which make it possible for us to produce a wide array of products and develop new materials. In addition to many types of testing equipment and analyzers, we have full-size vacuum forming capabilities. This capability allows us to develop our materials how they will be used by our customers in product situations. 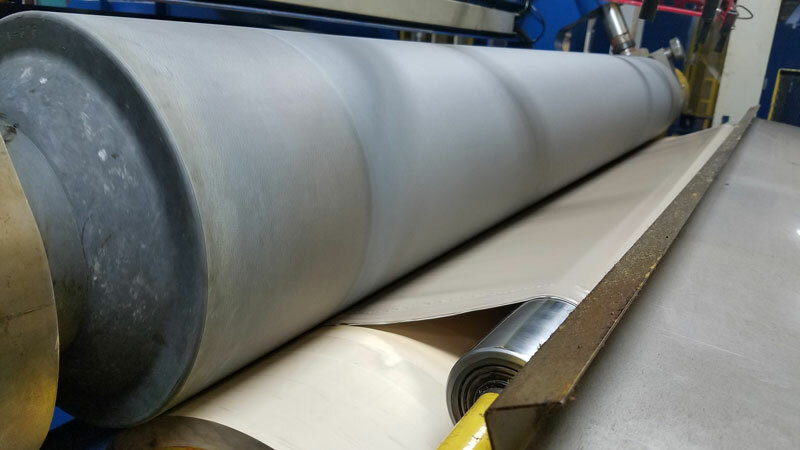 We have the ability to develop texture from concept to design including the manufacturing full-width trial emboss rolls. Plastic Films (PVC, PP, TPO, ABS, etc). Okamoto Sandusky is dedicated and committed to becoming a Globally Preferred Supplier through achieving Total Customer Satisfaction. We will strive for excellence in the Prevention of defects and the Continual Improvement of the effectiveness of all our activities.